As your company grows, your IT needs evolve. Your IT infrastructure must keep up with these changes. Updating the infrastructure often requires an upfront investment. 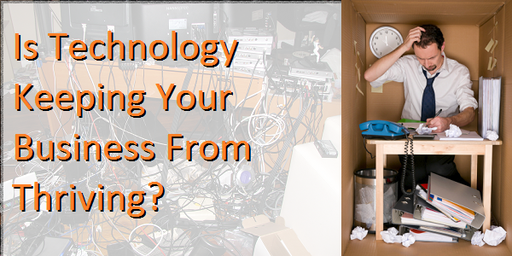 However, the costs incurred from staying with your current setup can be more costly in the long run. Do your applications or IT services work at a snail’s pace or sometimes stop working altogether? Slow speeds and intermittent outages can be a sign that your workloads are overwhelming your IT infrastructure. Slow speeds hurt employee productivity. Outages crush it because there is downtime. Downtime costs small-to-midsized businesses thousands of dollars per hour, according to an IDC study sponsored by Acronis. To avoid these costly hits to your bottom line, it is important to test the performance of your IT infrastructure when your applications or IT services are slow or stop often. The tests might show it is time to scale out or upgrade your IT infrastructure. Cybercrime will cost businesses worldwide more than $2 trillion by 2019, according to a Juniper Research study. Counter to what many small business owners believe, having a small business will not protect them from cybercriminals. A Symantec study found that more than a third of all reported targeted attacks in 2014 were against small businesses. Cybercriminals often target small businesses because they usually do not have the expertise or resources to fend them off. To avoid the expenses incurred from a cyberattack, you should regularly check the strength of your cybersecurity measures to make sure they are adequate for your growing business. If they fail a checkup, you need to find a better way to protect your data and systems. Even if your security measures pass the checkup, you need to stay on top of new regulatory or industry rules so that you stay compliant. As your company grows, it is important to keep all your software and firmware updated with the latest updates, especially security patches. Making sure you have installed all the security patches on all your devices is critical to a secure IT environment. A secure IT environment will help ward off cyberattacks and their associated costs. Updates are not the only things you need to keep abreast of. You need to also keep track of expiring service contracts, end-of-life issues, and other time-sensitive items that need to be monitored to keep your IT systems humming. For example, it is important to replace older equipment on a set schedule to maintain productivity. Saving a little bit of money on outdated equipment can end up being far more costly when you look at the downtime or slow productivity speeds that old machines force on staff. Do you hate creating reports because doing so requires working with a frustrating system? Your IT tools should be a blessing, not a burden. If sorting out the administrative details of your business is too difficult, it is time to get a new reporting solution. It can help you report on your accounts, expenditures, and partnerships in a stress-free way. Your productivity and your mood will improve. Some businesses take a fix-it-now-and-deal-with-it-later approach when dealing with IT issues. However, using stopgap or piecemeal solutions can cost a lot of money in the long run. Implementing a solution that lets you manage your IT assets as a cohesive system can improve the performance of your IT infrastructure. It can also eliminate the costs that come from having disjointed solutions. Our highly-qualified IT professionals can give you a sound assessment of your computer systems and software. With our help, you can discover productivity issues, cybersecurity threats, and other types of problems that might be eating into your bottom line. Besides detecting problems, we can offer solutions to resolve them. Together, we can find a solution that fits your growing business. Next Tired of Software that doesn’t Meet YOUR Needs?